Most of this book was transcribed from live channelings all over the world. The difference this time is that these channelings are dated for you, and they represent a lineage of energy that is sequential. That is, you get to see the channelings as we approach the millennium, pass the marker, and move into the new energy. Chapter one presents an explanation and description of some very confusing and difficult issues, but ones that Kryon deals with throughout this book. The discussion of reality, time, and multidimensional issues are difficult concepts. These concepts are needed, however, before the channelings begin. Don’t pass this chapter by. It’s a necessary treatise to try and simplify some very basic concepts, but ones that we don’t normally get into. As the new millennium energy works with us, we are going to have to grasp the fact that what we saw as our old and constant reality is now changing to become something else. How does this work? How can time itself be variable? This chapter is my attempt to explain things that are almost inexplicable but that have attributes we are going to use on a daily basis. Chapters two through seven present the channelings before the millennium change. 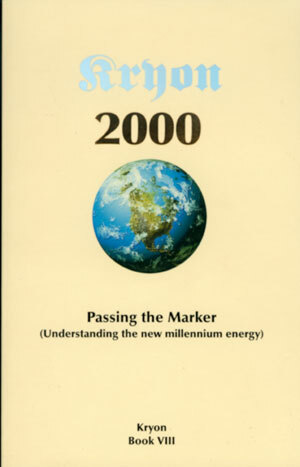 Chapters eight through twelve present channelings given after the passing of the marker, up through June of 2000. Chapter thirteen contains two Kryon concepts that are expanded on by Jan Tober (coauthor of the book The Indigo Children, and a partner in the Kryon work.) Many have heard of the Death Phantom (Shadow Termination is what Kryon called it), and Jan explains it from firsthand experience. Chapter fourteen features writings from three individuals who are doing a profound follow-up on information that Kryon channeled at the United Nations in 1998: Marc Vallée and Woody and Catie Vaspra. Kryon spoke about the creation of a Council of Elders on the planet—an indigenous group of tribal leaders who might supply the rest of the world with wisdom about our times—information we need right now. Chapter fifteen is a scientific update on some of the issues that Kryon may have spoken of in previous Kryon books as well as this one. These are usually channeled concepts that have been validated since the last Kryon publication. It also contains a discussion regarding my continuing search for evidence of the magnetic properties of DNA, something that is beginning to be a real possibility. Chapter sixteen is a compilation of some of the Kryon news, ways to get online with us, and a section featuring Kryon products and how to obtain them. Following that is something I’ve wanted to give the Kryon readership for some time—a complete master index of the entire set of Kryon books! Dear reader, I am filled with joy to be able to again give you what has become my contract on Earth: to try and pass the loving information and compassion from a wonderful angel named Kryon to your eyes and hearts.